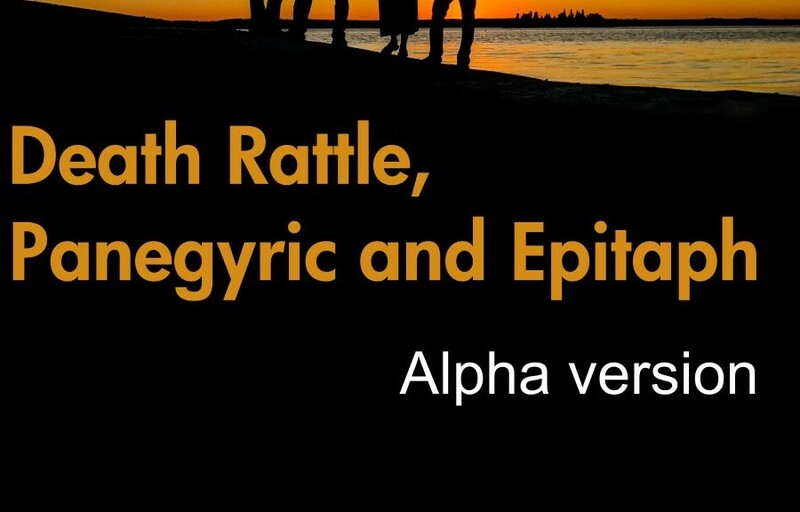 Death Rattle, Panegyric and Epitaph is a game about death, about dealing with death, about getting through the grieving to keep on living. In Death Rattle, Panegyric and Epitaph, a common acquittance of the players’ characters has just died, causing them great sadness. But they are contacted by the deceased and asked to finish some of his or her pending issues. Like, maybe, finding the killer. All the players together handle the dead one, known as the Player Ghost. The Player Ghost grants some power over the narrative to the players, and some powers in the game world to the players’ characters. Through the game, the player characters and the player ghost will advance through the five stages of grief of the Kübler-Ross model. In each phase, the powers granted by the Player Ghost will vary. The game uses a diceless system, and it can be used on top of other games to play a small side story after a significant death in many campaigns. It will be very adaptable, to adjust the ghost and the ghostly powers to the desired level. Does all this sound interesting? You can download the first draft (in Spanish only, I’m afraid), written for and inspired by a mini-rpg contest (Rolero de Hierro 2015). It is published free here, under an open license, etc. During the following weeks I’ll post a design diary of the game, trying to explain the system, and the thought process behind it.